It’s authentic. It’s versatile. It’s humongous! 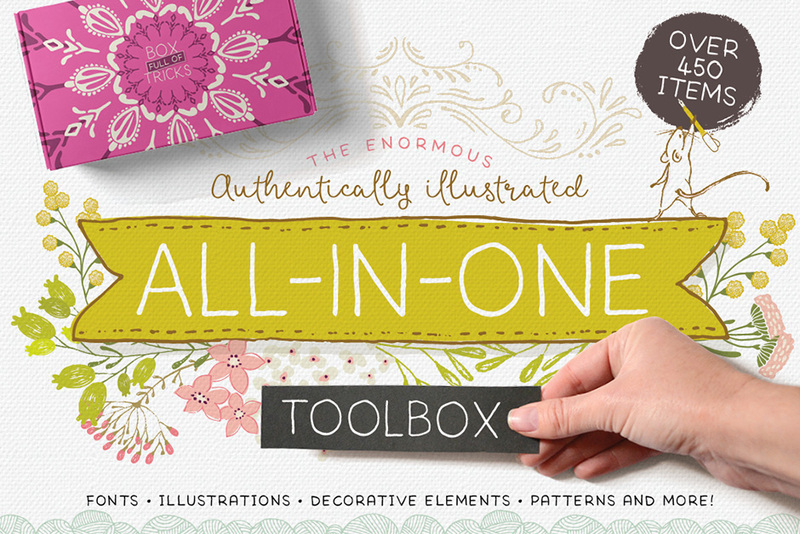 Introducing the Authentically Illustrated All-in-One Toolbox. We’ve teamed up with the fantastically talented Lisa Glanz to bring you an incredible new hand-crafted product. Adding a special hand drawn quality to a creative project can take ages to achieve, that’s why I spent months handcrafting this set so you don’t have to! With careful consideration for your design needs, I’ve created an All-in-One pack filled with tons of goodies to help you tackle any creative project with ease. With over 450 items including fonts, illustrations, decorative elements, patterns and so much more, your design toolbox will be fully stocked ready for any design challenge. Create branding, packaging, stationery, merchandise, posters and more, this pack has it all for you to go forth and create! And to make sure you never skip a design beat, I’ve included an Illustration Toolkit which is a conveniently layered document with oodles of inspiration, ready for you to design masterful logos, invitations, greeting cards, Instagram posts etc… The sky’s the limit! And you don’t need to be a guru to use it, I’ve included handy instructions plus a video tutorial! With so many resources your design toolbox will be brimming with tools and inspiration! Vector file: Adobe Illustrator CS3 or newer. Raster file: Adobe Photoshop CS3 or newer. Raster files: .PNG files can be opened with most photo editing software – please check your software for compatibility. Raster files: 12” x 12” 300dpi JPEG files can be opened with most photo editing software – please check your software for compatibility. Software compatibility: Adobe Photoshop and Illustrator CS3 and newer. File size is approx 1.1GB (1.62GB unzipped), offered as a single download, as well as a 3 part download. Are the colors editable on the background patterns? Thanks so much for reaching out to us Janine! We’re really sorry for the conversion rate and for any confusion caused by the compatibility of this pack. We do always list the compatibility of all of our products on their deal pages and Lisa has advised that the Illustration Toolkit will require Photoshop or Illustrator CS3 or newer, and so may not work with Corel Draw unfortuantely. Lisa has however included PNG and JPG files for the Illustrations, Shapes and Flowers, and Patterns packs so these should definitely work in Corel Draw for you. Hi can this be used with the illustrator app? Thanks so much for commenting! Lisa, the designer behind the Enormous, Authentically Illustrated All-in-One Toolbox has advised that all of these resources will work in Illustrator CS3 and newer, so you should definitely be able to work with these! We are always happy to help if you have any questions about working with any of your resources Jennessa, so please let us know if you have any queries :). I have gotten so much use out of this. Endless creative possibilities! Thank you, Lisa for another great product! Aww thank you so much for your comment and that is awesome to hear- we know Lisa will be so happy that you really love working with this one! Hello! Will this pack work with Affinity Photo? I normally use Corel Draw but I don’t think it’s compatible… thank you!! Thank you so much for reaching out to us and I’m so sorry for any confusion caused by the compatibility for Lisa Glanz’s All in One Toolbox! The great news is that we always list the compatibility and file types included for all of our packs so my sincerest apologies if you missed this on our deal page. As Adobe advise in their Support section that Affinity Photo should be compatible with Photoshop files, you should be able to work with these, along with the PNG and JPG files that Lisa has included for her Illustrations, Shapes, Flowers and Pattern files. Unfortunately we do not work in Affinity ourselves, but please do not hesitate to pop us over any questions that you may have- we are always happy to help! You’re so welcome Isabel and I hope that my email helps. Were these in other bundles, or all they all new? Thank you so much for your comment Laura and I’m sorry for any confusion! Hello! Could I get more information on selling cards/stationary with these fonts/images? Thank you so much for commenting and I would love to chat more with you about using these resources for cards and stationary design! I’m also interested in using these items on cards and stationary. Could you please send me an email explaining this type of use as well? Thank you so much for commenting and rest assured I can certainly help give you more information on our licensing for working with these! I’m wondering if it’s possible for me to purchase just the “Lilly Loo” font? My graphic designer used this font in my branding and I’d like to continue to use it. Thanks for the comment on this pack! Unfortunately the font Lilly Loo is only available as part of this pack and not currently sold separately so you would need to purchase this pack to ensure you were properly licensed to use it for your own branding or you would need your licensed graphic designer to make any changes for you! Hello, this is such a beautiful set! I have come across a problem though. The colour swatch document will not open in photoshop. It keeps saying there is an error. How can I resolve this? Thanks so much for the awesome feedback and I am so sorry that you are having trouble with this! This package is really amazing! I love the work of Lisa. It’s gorgeous!! Thank you so much! Thank you so much for your lovely comment :). We are massive fans of Lisa too and please do feel free to share anything that you create as we would love to see what you are working on! Hi I want to create custom jewellery message cards to sell – can I confirm that this is OK? Is this okay to create message cards to sell with jewellery online? I have popped you over an email about your query as I just need to get some more info from you to make sure your work is covered by our license but rest assured I should be able to help! Hello! Am I allowed to use the designs and fonts to create kids posters and stationary? And may I include them at my wholesale catalog for small shops to resell my products? I have just popped you over an email with some more details on our license, but rest assured I can definitely help with this! Bought it, but have some issues with “apples” pattern. How could I make it seamless in Corel Draw (I have no Adobe Illustrator)? Thank you so much for your comment! I’m really sorry to hear that you are having some trouble working with the seamless patterns in this pack. Unfortunately we do not work with CorelDraw so we are unable to test this on our side and confirm wether these files will work for you – my apologies for any inconvenience caused! I’ve done some research into this and have found a couple of tutorials on how to create seamless patterns in CorelDraw – I’ve sent you a quick email with some more information on this. I hope it helps! This package is amazing! 50% off combined it with 4 other items for another 50% off!!! Thank you! Thank you so much for your lovely comment, Ruby 🙂 We hope you’re enjoying your new resources! Absolutely amazing! I just had to get this bundle along with some others of Lisa Glantz’s work. I’m really looking forward to creating with all her fun art! My favorite is Lisa’s cute woodsy animals they are the cutest! You’ve done it again! Your work is great! Thank you so much, Anke 🙂 We really appreciate it! Beautiful stuff! Must tell you too that I like your presentation video very much. Well done and also sparks the imagination. TY! Thank you very much, Echo 🙂 It’s great to hear you are liking this pack! First of all, I love this pack and have been able to use it for several projects already! However, I am having an issue with some of the patterns. I know they are supposed to be seamless, but when I’ve tried to use several of the “geometric” patterns as a large background, there are very noticeable lines in the background and they aren’t seamless. Do you have any suggestions on how to fix this problem? I’m really sorry for this inconvenience with your seamless patterns. Rest assured, I am on the case! I have sent you a quick email to assist you with this 🙂 I hope it helps, and please don’t hesitate to contact me should you have any other questions. I’m here to help! As a greenhorn in the huge filed of illustration I may start my first steps with this wonderful and lovely toolkit (<3 to Lisa Glanz). The software compatibility speaks of Adobe Photoshop CS3 and newer. Until now, I just know Photoshop Elements. My question: Is this illustration toolkit not working with Photoshop Elements? And if not: why? I hope this helps, Carolyn, and please don’t hesitate to contact me should you have any other questions. I’m here to help! Simply beautiful like all of Lisa’s creations! Do the fonts support the German letters ß, ü,ä,ö? Coudn’t find a preview. Thank you kindly, Anke! 🙂 We really appreciate it! I’m pleased to report that all of these fonts support German characters 🙂 I hope this helps, and please don’t hesitate to contact me should you have any other questions. I’m always happy to help! Will this offer expire, and if so when? Thank you for your comment! I’m pleased to report that this pack is in our marketplace to stay and won’t be expiring any time soon 🙂 I hope this helps, and please don’t hesitate to contact me should you have any other questions. I’m always happy to help! That is incredibly kind of you to say, Nyle 🙂 Thank you so much! I hope you are able to add this pack to your creative toolkit soon! This is my best purchase yet! I Feel like a kid in a candy store. One question—where can I find the background textured paper used in the product overview? Thank you for your purchase & the lovely feedback! I hope you’re enjoying working with these resources 🙂 My apologies for the missing paper texture, rest assured, I’m on the case! – I’m sending you an email to help you get up and running with this. I hope it helps! Haha! Thank you so much for your awesome comment, Liv! It really means the world to me & the team to have your support 🙂 I hope you love working with these new awesome additions to your creative toolkit! Hi, what is the Commercial Use Policy of these? For Small Business Use? I hope this helps, Lhey, and please don’t hesitate to contact me should you have any other questions. I’m here to help! No hesitation – bought it immediately. Super excited to play with this this weekend!! That is so awesome, Katherine 🙂 thank you so much for your purchase! I am absolutely in LOVE! I am a new fan for life! Can’t wait to start playing with all these cute designs…very happy with this purchase! I hope you enjoy working with your new resources, Velvett! If you have any queries or if there is ever anything I could assist you with please do let me know. I’m always happy to help! Thanks so much for your comment I can certainly help you with your query 🙂 the great news is that all of the whimsical characters, patterns, elements etc featured come in PNG format and should work for you in most graphic software. I hope this helps, Cheryl, and please don’t hesitate to contact me should you have any other questions. I’m here to help! Oh no! I missed out. How did I miss out on this? I did check for new things in the marketplace yesterday… Or was it the day before yesterday? I’m still train-lagged. I am bummed on your behalf, Claudia. I missed the intro deals on “Salt & Pepper” and one of the Spring packs. So, I bought those and a few additional items from the DC Marketplace which made for ridiculous low prices (the build your bundle feature.) You can still buy this and get a great deal if you buy several items! Anytime, Ben… always happy to help a fellow Design Cutter out 🙂 which is why I will also mention that following DC and LG on social media is the perfect way to get reminders about fab deals. Do I get to be the official spokesperson today, or what? Ha! Oh no! I’m so sorry to hear you missed out on the intro price, Claudia! This has now expired I’m afraid but Amy is absolutely right – you can defintiely combine this with some other awesome items from our marketplace to get a super discount! Apologies again for any disappointment caused, Claudia, but if there is anything else I can help you with please do let me know, I’m here to help! Thank you so much for purchasing this pack and for getting in touch with your incredibly kind words 🙂 the whole team & I are so pleased that you’ll be able to get some great usage out of these resources! Happy designing, and if there is ever anything I could assist you with please do let me know. I’m always happy to lend a hand! Cannot say, these offers are pretty sweet and you must read my mind when I need something like this… I am happy, my clients are happy and well… thank you! We can add your other artwork into this toolkit by sliding them into the appropriate folder layer, correct? Always love your work and wish it would be possible to sit with you for a day just to learn a smidge more about photoshop and all of the potential for creativity that is there. Off to buy now and thank you! Thanks for your comment! When it comes to working with the Illustrator Toolkit, Lisa has provided an amazing pdf guide with this product so I would definitely recommend checking it out when including more artwork into it 🙂 If you do have any queries with this, please do let me know and I will happily lend a hand. I hope this helps, Julie, and thank you so much for your kind words! Please do contact me should you have any other questions. I’m here to help! The fonts alone were worth the price of admission. SO. MUCH. GREAT. STUFF. Yes, I stopped work to buy this. Thank goodness I have a flexible schedule and thanks also to DC for sending the reminder. Thank you so much for your kind words & for your purchase 🙂 I hope these resources make an awesome addition to your creative toolkit! Yet another amazing package…..I am seriously addicted to your work…love all your animal illustrations particularly. So excited to start working with this one. Thank you kindly for your lovely comment, Sharon 🙂 I’m sure Lisa will be absolutely thrilled to hear this! I hope you enjoy working with your new resources! If there is ever anything I could assist you with please do get in touch. I’m always happy to help! Thank you so much for your incredibly kind words! It really means the world to us here at DC & to Lisa as well 🙂 We hope you enjoy working with these new additions to your creative arsenal! Thanks for getting in touch and thank you for your purchase! I can certainly help you out with this 🙂 I’ve just sent you an email to help get you up and running with this texture item. Where is it… The Lisa Glanz rehab clinic – I NEED TO BOOK IN IMMEDIATELY – I’m officially an ADDICT! I am always amazed at the amount of work these bundles represent. It is obvious that the artists who create them are doing what they absolutely love… and how wonderful that they have a way to share that, with we who need quality resources… I wasn’t planning to buy anything tonight… but I think now I’m gonna have to. Thank you again for your support, Diana. It really means the world. So thrilled to hear you love the pack! I created the cream background using the Offset path function in Adobe Illustrator. So if you select your shape/frame, go to menu > Object > Path > Offset Path… A window will pop-up where you can enter your offset amount as well as the joins etc, I recommend using the Round Joins option because of all the points on the path – keeps things smooth. Hope that answers your question. If you have any other questions at all, please don’t hesitate to let us know. that worked perfect:))) THANK YOU SO MUCH!!!!! I love Lisas’ art. So very cute! Maybe I could have resisted this package except that the delicious fonts put it over the top. So much to do now! Thank you so much for your purchase, Debra! It’s awesome to hear that the 4 new fonts from Lisa made this pack a must-have for you 🙂 I hope you enjoy working with them! What can I say, Lisa’s work is always stunning! Can’t wait to play with the new set of lovelies! We couldn’t agree with you more, Ksenia 🙂 I hope you enjoy playing with these new items of yours! I’m so excited! I just woke up bleary-eyed, checked my phone and saw the email, and BOUNDED out of bed to grab this 🙂 <3 Lisa Glanz! Her designs are so adorable! I can't wait to use this to make some things for my new grandbaby 😀 Whee!!! Haha! That is amazing, Shannon! Im instantly a sucker for anything you create! You make me a better designer! Thank you Lisa! That is fantastic to hear, Christine, and I’m sure Lisa will be absolutely thrilled to hear this 🙂 Thank you so much for your kind words! “Resistance is futile – got it!” Yep – same here! 🙂 I am new to the DesignCuts community, but already head over heels in LOVE with all your content! Thank you so much Lisa! Great work Lisa! As always! Beautiful collection! You are so inspiring!!! hi, which editing program can you use to open the fonts, patterns etc?? I hope this helps, Satish, and please don’t hesitate to contact me should you have any other questions. I am always happy to help! hey! is this completely new stuff, or were the creations already included in other packages? Hope that answers your question. Let us know if you have any other questions at all. Just purchased and in love, yet again! Thanks, Lisa! Literally just did a happy dance after purchasing this. I love everything Lisa makes! Can’t wait to create!! Thank you so much for your purchase 🙂 I hope you enjoy creating with all these new items! Hi, as a BIG fan of Lisa’s designs & Design Cuts I couldn’t resist not to buy this great bundle 😉 Love to play & create with the lovely designs & fonts. Thank you so much for your purchase & for your lovely comment 🙂 Lisa & the whole DC team really appreciate your support! I hope you’ll enjoy your new resources and will get loads of use out of them! If you have any queries, please let me know. I am always happy to help! Now got to go send more money to paypal for this kit. Yes, cats would be a welcome addition to your lovely designs! Love, love, love your work! Thank you for the kind words, Teresa! 🙂 It looks like some feline friends would make a great addition to a future product from Lisa. We’ll be sure to pass this suggestion on to her! Yes! Cats please. Pretty please. I love all animals but cats are the most dear to me. With every hint at a new project, my heart speeds up in hopes there will be cats in it. Small cats. Big cats ( as in wild). Brown tabbies, orange tabbies, black cats, tortoiseshell cats. Lions. Tigers. Jaguars. Snow Cats. All sorts of cats. Wow! That is amazing, Amy! Thank you so much for picking up this toolkit along with some other awesome resources from Lisa! I hope you enjoy working with them all 🙂 It’s also great to hear that being a fan of Lisa Glanz runs in the family! Are the whimsical characters in vector format? Is there anything that is not vector?Thanks. All the elements are available in vector format, except the fonts of course 🙂 So all the whimsical characters, patterns, elements etc are all available as Adobe Illustrator files (CS3 or newer required). For Adobe Photoshop users, I’ve also included everything in raster format. If you have any other questions, do let us know. This bundle is FANTASTIC. Thank you tons! Beautiful bundle. Thanks so much for the great offer! I know I’ll be putting it to good use! Great package! A tutorial on how you made the promo video would be excellent and appreciated. Amazing product! I would also love a tutorial on how you made the promo video. Well done! Wooow amazing job! and so generous from you to share which programs you´d use. Thanks! Thank you so much for your kind words! I really appreciate it 🙂 It was great fun putting this one together and I’m so pleased you like it! So thrilled you love it Natalie! Thanks so much for your purchase, it’s much appreciated! Jij maakt van die mooie dingen!! Dank je wel. Dankie! YAY!!!! I’m happy that I have already cleaned the house 🙂 guess I’ll stay op very very late today, and tomorrow and the day after tomorrow.